Fox News to Exclude Ron Paul in Coming Candidate Forum? According to a press release from the campaign of Presidential candidate Ron Paul, Fox News – scheduled to hold a nationally televised debate in New Hampshire on January 6 – may have decided to exclude the surging candidate from their forum. So far Fox has announced invitations to Rudy Giuliani, Mike Huckabee, Fred Thompson, John McCain and Mitt Romney. New Hampshire’s primary is scheduled for two days after the debate takes place. It is yet unclear whether this is simply an oversight on the part of Fox, however if it is indeed a deliberate move it is left to wonder what justifications the network used in coming to their decision to dismiss Paul. While Paul has yet to crack double digits in national polling, a number of his campaign successes demonstrating support for the candidate suggest other metrics need to be taken into account. To begin, according to Paulâ€™s website, the campaign has received more than $18.8 million in contributions this quarter, over $7 million more than Giuliani, the top fund raiser during the previous quarter, managed during that period. Further, with a fund raising event scheduled to coincide with New Years Eve, the Paul campaign is expected to finish the quarter with over $20 million in contributions, a sum that would almost assuredly make him the victor in the race to raise the most fourth quarter funds. Further, Paul has demonstrated increased support in key early-primary state polling, including the state of New Hampshire where the debate will be held. In the most recent Rasmussen poll of likely Republican voters in New Hampshire, Paul placed ahead of Thompson and in a statistical tie with Huckabee and Giuliani, all of whom have been invited to participate in the debate. In Iowa, where voters will head to the polls in less than one week, Paul currently registers 10% of likely Republican caucus goers, again putting him ahead of Thompson and in a statistical tie with Giuliani and McCain. Also demonstrating Paulâ€™s strength in the Hawkeye State, the Iowa Independent recently ranked him third in their GOP Power Rankings, noting their observation that Paul has a stronger base of support in that state than all other GOP candidates save Romney and Huckabee. Considering all of this, Foxâ€™s decision to exclude Paul, if indeed that remains their course of action, raises a number of key questions. To begin, how can the candidate likely to raise more funds than any other candidate in the final quarter of the primary cycle be excluded from a key debate? If the answer to that question relies on polling figures, how can it be ignored that many of the invitees rank behind Paul in the key early-primary states? One answer might come from national polling figures, where Paul has consistently been ranked in single digits. Yet once again these polls offer no indication that Paul is out of the race. With 14% of respondents declaring themselves undecided, and the current leader at only 19%, Paulâ€™s standing of 6% does not preclude him from success, especially when considering the pollâ€™s 4 point margin of error, which places Paul in a statistical tie with Thompson, McCain and Romney on the national level. Even the boldest of political analysts would be remiss to predict with any certainty which candidate will emerge as the victor in the coming GOP primary race, and considering the volatility of the early primary landscape, the same can be said for predicting who will come in last, and certainly for who should be marginalized in the coming debates. It is thus laid upon the Fox Network to justify its decision to exclude Paul or clarify why he is the last to receive an invitation to the debate. One thing is certain, Paul’s supporters do not intend to take this slight of their candidate lightly, as various pro-Paul sites are organizing inquires to the network and in some cases even boycotts of the Networks advertisers, amongst other peaceful strategies. The debate is scheduled for January 6, and will be moderated by Fox News’s Chris Wallace. It will be aired live beginning at 8pm on Fox News Channel and Fox News Radio. His campaign is reported to be organizing a rally to coincide with the offending forum. 45 users commented in " Fox News to Exclude Ron Paul in Coming Candidate Forum? " This is a very well-written article, not to mention a great exposition of the components of this perplexing exclusion. Wow! They may have been able to exclude him months ago, but not now. Considering his fundraising was driven through grassroots and “funded” through grassroots (rather than special interests or personal finances), I would have to say they are definitely doing a disservice to their viewers. If anything this will raise a flag and further publicize the Congressman’s candidacy. He has polled higher than Thompson and is the leader in 4th quarter fundraising — I think they are excluding him because they don’t consider them part of the republican platform. I am sure with all this press; one of the other stations will be jumping on the wagon to talk to Paul. They have probably uncovered some of the information that is documented. about Ron Paul’s monetary as well as collegial type activities to neo-Nazi and white supremacists behavior. This is an excellent article and gives more exact information on just how Congressman Paul is doing statistically than I have seen elsewhere. This article should be linked and posted on many sites. Thanks Derek for a job well done! Fuel for the Flame of Freedom!!! I want to say thanks for the story. This will be awsome, I cant imagine how big this protest and rally for Ron will be. Fox News is going to have a backlash from hell and they deserve it. If they uncovered the information, I do wish they would present it. If I recall, a newspaper just posted a retraction for associating the Congressman with the Nazi agenda. Yes, I do hope they take a look at his monetary policy and then see why we are in this growing devaluation of the dollar. It’s absolutely amazing at how many people blindly post blogs for the sole purpose of name-calling and then leave. 85,000 cast votes in the 2000 Iowa Republican Primay. Does anyone think Paul will have at least 15,000 caucus goers?? All of these polls report likely percentages. If the Paul campaign is confident there are 15,000 Dr. Paul supporters…. then he should do very well. Keyes got a little over 12,000 votes in 2000. Looking at the raw numbers it does seem that the MSM is missing something. If Dr. Paul has even 10,000 caucus goers then I predict this will bring even more donations into the Paul campaign. Yea, the establishment is indeed worried. Here is link to CNN 2000 Iowa Primary results. Very interesting. Certainly Fox News couldn’t be silly enough to exclude Dr. Paul from this event. I can’t wait to see Hannity’s face when he has to announce that Ron Paul has won the New Hampshire Republican primary. I’ll boycott them, but I’ll have to tune in for THAT! Vicki, we all know there is no such activities by Ron Paul, and your assertions are nothing more than smear and slander. “Probably” doesn’t cut it, and for you to imply such a ridiculous thing shows how desperate you are to paint the only good man with such an evil brush. You should be ashamed of yourself, and you should simply move to North Korea or China if you want to see what racism and oppressive government is all about. Ron Paul stands for none of it. Hopefully the campaign will be suing your sorry a$$ for defamation of character. I sincerely hope that I’ll be able to send Fox News a nice spice rack after the NH Primary… it will go nicely with all the crow they’ll be eating. I would not want to be a Fox employee if they really try & exclude Paul. Talk about blowback. Concerning excluding Ron Paul from the New Hamspire Debate on January 6, 2008. (B) at any other time, the charges made for comparable use of such station by other users thereof. In the case of a candidate for Federal office, such candidate shall not be entitled to receive the rate under paragraph (1)(A) for the use of any broadcasting station unless the candidate provides written certification to the broadcast station that the candidate (and any authorized committee of the candidate) shall not make any direct reference to another candidate for the same office, in any broadcast using the rights and conditions of access under this chapter, unless such reference meets the requirements of subparagraph (C) or (D). If a candidate for Federal office (or any authorized committee of such candidate) makes a reference described in subparagraph (A) in any broadcast that does not meet the requirements of subparagraph (C) or (D), such candidate shall not be entitled to receive the rate under paragraph (1)(A) for such broadcast or any other broadcast during any portion of the 45-day and 60-day periods described in paragraph (1)(A), that occur on or after the date of such broadcast, for election to such office. (ii) a clearly readable printed statement, identifying the candidate and stating that the candidate has approved the broadcast and that the candidate’s authorized committee paid for the broadcast. A candidate meets the requirements of this subparagraph if, in the case of a radio broadcast, the broadcast includes a personal audio statement by the candidate that identifies the candidate, the office the candidate is seeking, and indicates that the candidate has approved the broadcast. Certifications under this section shall be provided and certified as accurate by the candidate (or any authorized committee of the candidate) at the time of purchase. For purposes of this paragraph, the terms “authorized committee” and “Federal office” have the meanings given such terms by section 431 of title 2. (2) the terms “licensee” and “station licensee” when used with respect to a community antenna television system mean the operator of such system. The Commission shall prescribe appropriate rules and regulations to carry out the provisions of this section. (iii) a national legislative issue of public importance. (G) in the case of any other request, the name of the person purchasing the time, the name, address, and phone number of a contact person for such person, and a list of the chief executive officers or members of the executive committee or of the board of directors of such person. The information required under this subsection shall be placed in a political file as soon as possible and shall be retained by the licensee for a period of not less than 2 years. And as a sidelight, the yellow journalism “diversion” has begun. A clip of Ron Paul discussing the theory of evolution, edited in an unflattering way, has been highlighted on the Andrew Sullivan site. Boycott Toyota!! They are sponsoring this debate. I told my Lexus dealer he would have to get all advertising pulled from FoxNews if I were to ever buy another Toyota. If this splendid candidate is indeed excluded, I will not watch Fox ever again or support their sponsors or advertisers, no matter what. That includes The Simpsons, my favorite show. Absolute, total boycott. Faux media machine propaganda – I hope they choke on their capitol excess, For I personally will be banning all sponsers of Faux as well as faux. Faux is FAIRLY UNBALANCED. To quote a Nevermore song – “The media machine knows what to do, knows how to feed the poisen in you – useless information for your usless little lives – TV lies and prophesize — DO you believe everything you see — children of the void come follow me” — This just feeds the enthusasim for the campaign even more so thank Faux for that – but a message to Faux FUQ!!!!!! The great thing about all of this is we are all realizing how corrupt Fox really is. I have a nice large list of their advertisers and am more then ready to cancel any and all ties to them as well as contact the advertisers letting them know why. We have paid cable tv that are paid to be biased BUT our local and national news should be unbiased and show ALL SIDES including Ron Pauls which has been rock solid for many years. THey might not see that as “news” but he is the only presidential candidate worth his weight in GOLD and that actually is worth something unlike our current dollar. The one honest guy in the race gets excluded. What nonsense. Get your friends out and vote. If you are a quiet Ron Paul, it is not enough. His message resonates. Don’t be shy about sharing it. FOX/Pravda maintains its Putin-est reputation for political censorship in its attempt to sway the election within this country. Time to purge the system….VOTE RON PAUL & STOP THE MADNESS! Well, I think Foxnews and the Murdochs are looking at a law suit, and if it isn’t by Ron Paul and his campaign, it will be by his many supporters. I think we need to get busy Ron Paul Supporters, lets get the ball rolling on Foxnews and watch them go down and watch Ron Paul dollars go up when we win!!!!!!!!!!!! WE THE PEOPLE will be heard, and there is no Foxnews out there that can stop us. Ron Paul has my vote and support. Foxnews has my promise to be boycotted, as well as it’s sponsors, I just cancelled my Nextel/Sprint phone (they are a Foxnews advertiser). If Fox went forward with the exclusion of Ron Paul it would be extremely strange and ill thought out. I’m a Ron Paul supporter, but even people who disagree with him should know that this sort of behavior by a mainstream news source should not be tolerated. In a brief fit of insanity I flipped on the radio this afternoon while driving. What amazing timing… it was a replay of Hannity’s program the day after the CNN/YouTube debate, and he was giving a lengthy and passionate rant about the obvious bias against the Republicans in the question selection, planted questioners, etc. I don’t disagree about that, but isn’t it ironic that someone so clearly biased himself – toward the neo-con agenda – is so upset at similar bias against his pet candidates. Heh, heh. Great writing. It is really a pleasure to read such thoughtful commentary. Happy New Year! I thought that Murdoch was a Hiliary lover (probably helped with promoting the gun ban in Australia since he is from there)??? He must really be fearing that Ron Paul is the only Republican that could beat Hiliary for sure so Let me know where the event is and I will be outside it and at the polls on the Tuesday for Ron Paul. I hope people making these totally bogus statements are not voting for one of the other supposed Republican candidates (Neo-Cons) that are flip flopping, Like Real Id, anti-gun , Patriot act lovers, put pot heads in jail, ban the queers, forced Christianity, anti-war people to be anti-Amercian and on and on…. I really think Fox is making a huge mistake on this. Paul has too many vocal & active supporters to try this mickey-mouse antic. Fox News the Murdoch propaganda machine is unsurprisingly trying to suppress any commentary on the currant state of affairs. Dr. Paul detailed the whole tangled mess that we have made in dealing with Pakistan. MSM does not like the Americans to know that our CIA installs puppet governments. Then these governments are awarded with billions of dollars, stolen from the American taxpayers or if they fail to perform accordingly these governments are threatened, replaced or bombed. Around the World people are listening to Dr. Paul’s rational solutions to many international problems. His message of freedom is growing and they are frightened that their despotic plans will fail. I will not watch Fox News again. I am contacting all of the advertisers and I will tell my family to sell their stock. This is the final outrage! copy the letter to clipboard then click the link. 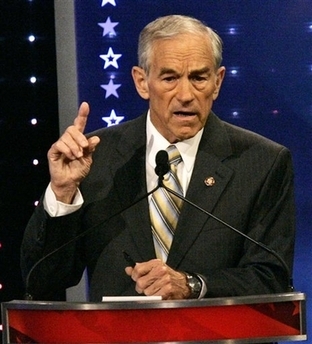 I am writing to express my disappointment and displeasure upon discovering Dr. Ron Paul will be excluded from the New Hampshire Debates. Dr. Paul has placed #1 among Republicans AND Democrats at AOL’s spam-proof poll. Dr. Paul LEADS ALL Republican candidates in fund raising this quarter. Dr. Paul is tied for third place in IOWA. Dr. Paul’s support is known to be great among Independents, former Republicans and Democrats. Surely these people deserve to have their candidate heard! Dr. Paul Is the MOST searched for candidate on the internet. The exclusion of Dr. Paul from these debates would be for me the final convincing piece of evidence that we the American citizens are no longer in control of our destiny. Once the process to file FEDERAL complaints via the FCC is automated, you may expect a flood of letters to your affiliate stations stating FOX affiliates are NOT acting in the public interest. Fox News’ corporate sponsors would no doubt be interested to know that, due to their affiliation with a corrupt and biased network, we are boycotting their products. Here is a list of contact information for Fox News’ sponsors. I would love to hear Bill Kristol’s take on this. What a joke. I’ve known for years to snicker to myself everytime they say ‘fair and balanced’, but I thought the bias was in support of conservatives and the republican party. I think RP will get more bang for the buck by being excluded…especially if there is any coverage of all the RP supporters protesting the event. I am a Republican watching from a distance After FOX decision to exclude Ron Paul, it appears he’s correct about the industrial complex controlling government.I will be voting for Ron Paul in the election…no one is more surprised then me. I stopped watching fox and we will all boycott soon anyways, they have proven to be overly biased BUT also pulling poll numbers because they “assume” fraud is going on. Why would that only be with ron paul supporters and not any other candidate? makes you think others would do the same right? if that were infact happening. Either way, fox debates are laughable and while they do that we will be doing our grassroots spreading TRUTH instead of the same candidates that fox pitches. I don’t believe in giving away our national sovereignty, but maybe it’s time we brought in the Russians to monitor our election process. Well .. is it the 5th or the 6th?!? Everyone keeps saying the 6th. There are stages for the politically motivated to display their worst behavior but major TV networks, parading as unbiased purveyors of information to the general public should not behave this way. Ron Paul supporters have succeeded in raising huge amounts of money for their candidate. Do they have the moral character to stand up to the Main Scream Media by boycotting the sponsors who keep these pirates in business? I’m sure ABC and Fox would have a second round of thought if their corporate sponsors saw a sudden drop in beer, automobile and computer sales. I got so mad when I heard they did that and since they tried before and had to back off, I decided to go on a hunt to find out why Fox is so hot to bury a conservative. It didn’t make any sense at all. Its not a liberal station, so there had to be some reason that is not obvious. Well, I found it and its a mind blower. Fox is owned by a foreign company called Newscorp. The board of directors contain these three guys so far and I have to research the rest but this told me volumns about what is going on. Here are the board members and notice who they work for. Bankers and globalists. The targets of Ron paul and part of his campaign platform. That is why fox is excluding him and that is a total violation of their FCC license to have a conflict of interest, then to use the publics airways to influence the out come of the election without filing with the Federal Election commission and its illegal as hell. I have not had time to research the others but you can bet I got the idea with some of the last names listed as directors. LOL Will continue and pass it around as soon as I finish if there is more to disclose. They are doing it again! They’ve done this in the past…exclude Ron Paul. It has been confirmed..Ron Paul hasn’t been asked to come (www.ronpaul2008 dot com). I’m sending FOX another email…letting them know they are obviously manipulating elections. FOX is Propaganda. Don’t like something a TV station or network does? Hit them where they’ll feel it. Contact sponsors who advertise on their airwaves and tell them you will not buy their products because they advertise on a biased, politically unbalanced and unfair network. They’ll begin to hear you then. This is not intended to be a post …rather, I am inviting you to view a “Hit Back” for Ron Paul Graphic I created to counter Fox News snub of Ron Paul in the Fox News Jan. 6th GOP Presidential Forum. I it is possible for you to include these graphics on your web site for people to download and use, I would be very appreciative. I have sent an email to American Express about my concerns with them sponsoring Fox News. I’m going to stop using their card which is my card of choice if they do not disconnect with Fox. My sprint phone is up for renewal. I guess I’ll let them know as well. This really makes me sick! Fox news used to be may choice “tool” for news research. This is no more! Fox can wilt away with the rest of the corrupt people in this country. We preach equal opprotunity, diversity, etc and then they do this. What our coutry is doing now is obviously not working. Ron Paul is the only one that consistantly votes NO! to laws that are not working even though everyone else votes YES!. Lets all look outside the box and wonder if maybe the “majority” in our government is dead wrong. Remember… Our government officials SWORE to protect the constitution against ALL enemies both foreign and DOMESTIC but yet they undermine it at ever turn. Makes me wonder who is telling us the truth as Ron Paul’s FIRST consideration on laws is.. The Constitution.